Divine goddess Laxmi, In Hinduism Every God and Goddess have their separated importance . If we talk about maa Lakshmi she is the goddess of our good luck. She is symbolizes as good luck. The word Lakshmi came from Sanskrit word Laksya, and she is the goddess of wealth and prosperity of all forms, both material and spiritual. Lakshmi is the household goddess of mostly all Hindu families and is worshipped daily, but the month of October is the month of festive month for maa Lakshmi. Maa Lakshmi is the daughter of Maa Durga, and she is the wife of Lord Vishnu. Birth story of maa Lakshmi started when lord Indra met sage Durvasa with respect sage gave a garland of flower to lord Indra, lord Indra accepted that and put that garland of the head of his elephant named Airavat. Airavat through that garland on the earth. After seeing this, Durvasa got furious angry and thinking that how lord Indra did this to me and said to him, “You have an ego, that garland was the residence of the Goddess of fortune. Sage Durvasa cursed Lord Indra and said, one day your pride and your kingdom will be ruined up like what you have done with my given gift garland. Sage Durvasa went to somewhere and also lord Indra returns to his residence. After the curse of Durvasa everything continuously changing in the nature and heaven. Gods & people from the earth started to lose their vigour and power, all corps related products and trees were dying, men stop doing good things, their minds became corrupted. Their all desires became uncontrollable by the lord Indra. All gods became very weak. Demons dominated on the earth as well as on the heaven. Demons defeated god one by one. Nature became so unfavorable to live there.As After being defeated by the demons, the Gods met to Lord shri Vishnu. Lord Vishnu gave them a solution if someone churn the ocean then we can come back with our original power and they all will be blessed with amrit and become immortal forever.This was the story of ocean churning means poison for demons and amrit for gods. Lord Shiva churned ocean which was mixed with full of poison. Also this was the beginning of war between demons and gods. From this churning of ocean, Goddess maa Lakshmi came out from the waves of the ocean sat on a full blown golden lotus. Maa Lakshmi chose lord Vishnu as her husband. All the Gods got their all power back and won over the demons. The popularity and importance of goddess Lakshmi is gauged by the actual fact that her sacred name—Shri. Shri is written atop most documents and spoken before addressing a god, a teacher, a good person or any revered individual. The word evokes amongst different things: grace, affluence, abundance, advantageousness, authority. When the word is spoken or written, associate degree aura of sanctity is established, no matter follows the word is imbued with divine blessing. Married men and ladies area unit self-addressed as Shriman and Shrimati as they need goddess Lakshmi's blessings to harness the wealth of the globe to support family and sustain society. Ascetics do not seem to be self-addressed as Shriman as they need renounced worldly riches; widowed men and ladies do not seem to be self-addressed as Shriman and Shrimati as they're still in preparation for the householder’s life. Just as the word "Om" is related to the magical aspect of life, the word "shri" is related to the fabric aspect of existence. Goddess Hindu deity means that sensible Luck to Hindus. 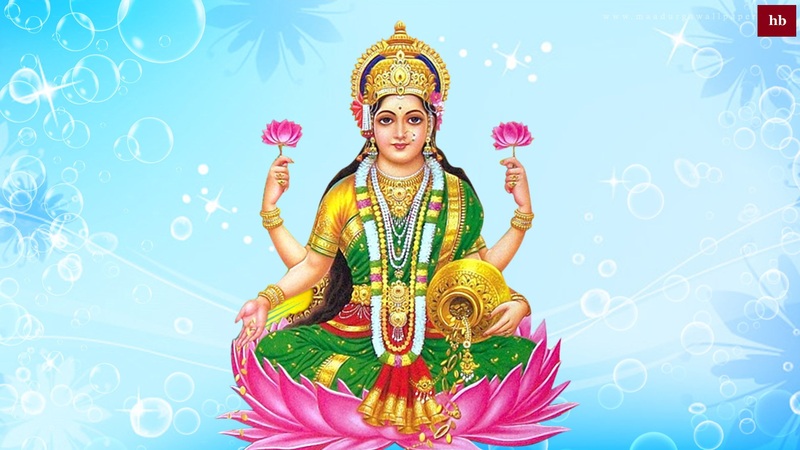 The word "Lakshmi" comes from the Sanskrit language word "Laksya", that means "aim" or "goal", and he or she is that the god of wealth and prosperity, each material and religious. She is that the god of prosperity, wealth, purity, generosity, and therefore the embodiment of beauty, grace and charm. Worship of a mother god has been a section of Indian tradition since its earliest times. Hindu deity is one among the mother goddesses and is self-addressed as "mata" (mother) rather than simply "Devi" (goddess). God Hindu deity is adored by those that would like to accumulate or to preserve wealth. It is believed that Hindu deity (wealth) goes solely to those homes that square measure clean and wherever the folks square measure tireless. She does not visit the places that square measure unclean/dirty or wherever the folks square measure lazy. She is that the active energy of Hindu deity. With 4 hands signify her power to grant the 4 Purusharthas, Dharma , Artha, Kama, and Moksha. Representations of Hindu deity are found in religion monuments. Goddess Lakshmi Puja is performed on the third day of the of Deepawali. All Hindu families enhance their homes with flowers and Ashoka, mango and banana leaves on the day of Lakshmi Puja. it's thought-about auspicious to stay Mangalik Kalash coated with unpeeled coconut at each aspect of the most entrance of the house. Goddess Lakshmi is remarked because the immortal of wealth and prosperity. The competition falls on Amavasya of Krishna Paksha within the Hindu month of Ashwin. it's believed that on at the moment immortal Lakshmi visits her devotees and bestows blessings and gifts on them. The immortal is conferred with four hands that represent Dharma, kama, artha and moksha On Deepawali, immortal Lakshmi Puja ought to be done throughout Pradosh Kaal that starts when sunset and roughly lasts for two hours and twenty four minutes. Some sources propose Mahanishita Kaal additionally to perform Lakshmi Puja. In our opinion Mahanishita Kaal is best suited to Buddhism community and active Pandits who apprehend the simplest concerning Lakshmi Puja throughout this special time. Goddess Hindu deity is adored in several households, temples and business institutions by individuals seeking peace and prosperity. She is adored each ceremonially and spiritually consistent with the sacred writing and Tantric traditions. Individuals worship her by providing her prayers and food, singing her numerous names, or meditating upon her pictures. Worship of eight Lakshmis (ashta-lakshmis) is additionally quite common. In all varieties of worship, utmost stress is set upon personal purity. Worshippers area unit expected to keep up a strict code of conduct and maintain utmost purity to earn her grace. During such worship it is customary for individuals to wish to her image or statute or symbols and build their offerings. They recite special prayers specially meant for her (Lakshmi stuti), or chant her names 100 or thousand-fold, and request blessings. within the Tantric worship, she is adored with mantras and yantras (mystic diagrams). Some of the necessary prayers self-addressed to Hindu deity throughout worship are: Shri Mahalakshmi Ashtakam, Shri Hindu deity Sahasaranama Sthothra Shri Stuti, Shri Hindu deity Stuti Shri Kanakadhara Sthothra by Shri Chatussloki Shri Hindu deity Sloka and Sri Sukta that is contained within the Vedas. Agastya Hindu deity Stotra. Lakshmi is particularly adored throughout Diwali competition by most Hindus with lots of fanfare. historically Indian businessmen, merchants and traders, open their annual account books when worshiping her in their offices and business institutions on this occasion. Everybody is aware of and celebrates a replacement year in 1st Gregorian calendar month however it is the assumption that Hindu twelvemonth stars from Diwali. Individuals amorously,they celebrate Diwali with nice happiness and-and begin their life by new hopes and happiness. individuals needs to realize continuously huge however they don not wish to struggle. They forget that nobody reaches the height while not falling. Attempting ought to never clam up, it must always in continued for. The method of continuity makes the outlet even in stone that we are able to see within the spring falling from the on top of the daily method of doing works guarantee the success thanks to there no any war and obstacles that can not be defeated when fighting unendingly. Therefore i feel its right time for taking commitment to be the eminent person. and additionally take the commitment for not symptom the others heart taciturnly. symptom others become issues for achieving the oriented goal. The grace helps us to ride and reach the height of success quicker. At the end, purity and truth wins the battle. All the voice square measure loudly crying within the land of Ayodhya that his king has killed the Ravan. News of comeing lord Ram was unfold even the fourteen years of banishment has finished and ram conjointly planned to return his kingdom. The folks of Ayodhya becomes terribly happy and lits the lams, oil lams starts singing the song of hospitable lord Rama in their kingdom once more this can be believed to possess started the tradition of Diwali. Year once year this homecoming of Lord Rama is commemorated on Diwali with lights, fireworks, detonating of wacky and merriment. The pageant gets its name Deepawali, or Diwali, from the rows of lamps that the folks of Ayodhya lit to welcome their King. Goddess Lakshami is that the deity of fine fortune and wealth. She is a very important female god within the Hindu pantheon of gods. Goddess Lakshmi is that the bringer of "Aishwarya" and "Vriddhi". Each active Hindu who is tangled within the involved net of "Maya" and "Moha" desires to please god Lakshmi. Those that square measure freed from the bonds of Maya and Moha and people who have renounced the approach of life additionally worship the god, because the approach of 'Marga to Moksha'. The presence of god Lakshmi within the house ensures that your family stays healthy, happy and peaceful. There shall be no suffering owing to need of something. If you are speculative a way to invite god Lakshmi into your home, this Diwali, worry not, as we have got some tips for you. Diwali may be a terribly auspicious time for Lakshmi Pooja and to ask god Lakshmi into your home. There square measure bound things that you simply will do to form positive that god Lakshmi is welcome at your home. browse on to grasp additional. Yantras of various sorts area unit sometimes utilized by the Hindu community to boost or assist within the betterment of life. however there is no Yantra that is thought of to be a lot of superior or powerful than the Sri Yantra. This Sri Yantra may be placed within the pooja space of your house. giving regular prayers thereto may be a should. If all the specified rules area unit followed properly, then the home is crammed with sensible luck and wealth. The lotus is one in every of the items that is thought of to be terribly near the Goddess's heart. She is delineate as sitting on a Lotus. Lotus is taken into account because the image of wealth and sensible news. You will be able to keep a lotus seed string of beads within the pooja area and use it to chant the Lakshmi Mantra. Doing therefore can fill the guts of the lover with purity, love and kindness. Shankh may be a univalve that has the lustre of pearls. Such conchs area unit rare to seek out and area unit thought-about as objects of Brobdingnagian religious power. Having it within the home is same to bring money gains. it is to be noted that the univalve ought to be unbroken wrapped in a very clean artefact that is red, yellow or white in color. Goddess Lakshmi is that the one that lights the trail to a brighter and happy future. Place a picture or idol of immortal Lakshmi in your pooja area. light-weight the lamps of clarified butter ahead of the immortal each morning and evening. If you have got a basil plant, light-weight a clarified butter lamp before the Tulsi plant too. Using Coconut To Worship immortal Lakshmi Coconut is associate degree auspicious fruit. It is therefore auspicious that it is referred to as Shri Phal. It is offered to all or any the deities within the pooja. providing coconut to the immortal Lakshmi daily invitations goodness into the house. Goddess Hindu deity is that the deity of wealth, fortune and prosperity and is taken into account to be the epitome of beauty. Several oldsters think about that naming their female offspring once deity Hindu deity can bring her smart luck. Here area unit some names of the deity which may assist you realize simply the name you are craving for. Do a jaap(Mantra) of this mantra 125000 times in seventy two days and a havan ought to be performed post this jaap(Mantra). This can be a Shodashopachar vidhi for Maa Lakshmi. This is a special Diwali Hindu deity mantra that has to be recited 108 times into twenty one times.